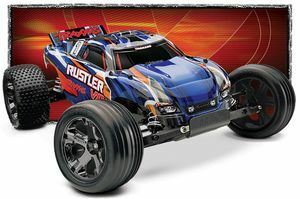 If your favorite place to race is an asphalt jungle, transform your Rustler VXL into an ultimate street machine with available Anaconda 2.8" street treads. These sticky, high-traction tires are made for aggressive handling on paved surfaces. The proven Anaconda design features large tread blocks that provide incredible grip and long-wearing performance. Buy them pre-glued and ready to install for instant on-road action.